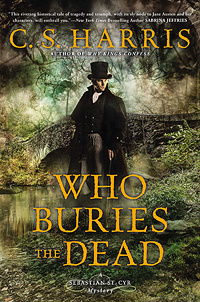 When the decapitated body of a wealthy, social-climbing plantation owner is found in the newly-developed area of Sloane Square, Sebastian is drawn into the murder. Are there links to the long-ago beheading of Charles I? Or is that merely a red herring. Hero's powerful father, Lord Jarvis, enters the mystery as he protects the monarchy at all costs. But even more valuable to him is his grandson and daughter, and Sebastian is well aware of the retribution that is his should either one be hurt. As always, complex plotting, complex emotions, and a totally satisfying read. It's a 5.